It’s marketing 101. Timing is everything. Reaching your potential customer with the right message just as they are ready to make a purchase decision is how you win business. But when is the right time for the moving industry? The window of opportunity to market to win a single one-time purchase like a move is small relative to other industries. Between knowing when a homeowner is a potential customer and when their actual moving day takes place can happen within a period as short as 30 to 60 days. A professional move is a significant expense, and homeowners are entrusting all their possessions to a moving company. The decision to hire is not an impulse buy but rather a well-researched purchase which means there are plenty of opportunities. 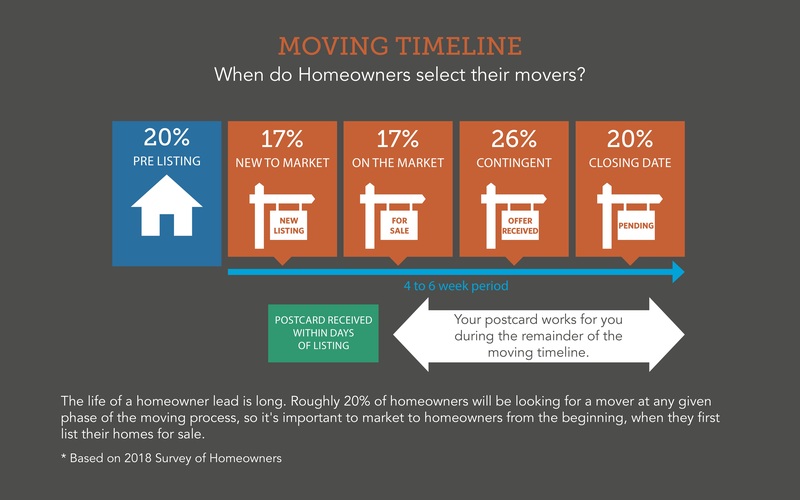 In our recent survey, homeowners gave insight on their decision-making process based on the timeline of selling their home. While some homeowners are confident enough to make decisions early, others wait until later when they have an actual closing date and have had time to research 3 or more movers. Decisions span over an average 1 to 6 week period after listing their home for sale. With the right leads and the right delivery of your message, you can master the ABC’s of timing and be favorably considered for the job. The key to timing in mover marketing is getting in contact early. 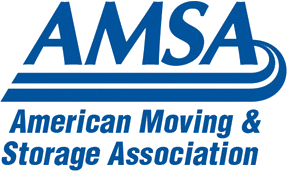 You want to reach homeowners BEFORE they have decided on a mover. Plan to reach them during their initial research process. You’ll win the early deciders, and also become part of the research process for those that decide later. Homeowners hold onto postcards and call when they are ready! Ensuring you’ll receive responses from decision-makers in all stages of the process. Tip: If you only contact homeowners once listings are pending, you’ll miss out. 80 percent of homeowners have already decided at the pending stage. You want to maximize your business opportunity, then you must reach homeowners early. Make it your goal to actively market to potential customers. If you are the first mover to reach homeowners with quality information, you will stand out. Why wait for the homeowner to find you using a search tool when you can actively give them the information they need to decide to hire you. 94% of homeowners said that they would research a mover that sends them a postcard. If you don’t send a postcard, you risk not being considered at all. Tip: You may think emails are a faster way to get in front of leads, but the truth is an email can sit unopened in a crowded inbox or be deleted in an instant. A phone call is disruptive and is usually done at an inopportune time for the homeowner. Have you ever been interrupted during dinner by a sales call? Postcards are a friendly, non-intrusive way to reach the homeowner and be included in their research. One timing aspect of mover marketing is when to expect a response. As we have shown, it is dependent on the timing of every individual homeowner. But with consistent mailings over a four to six week period, you will start getting regular phone calls. You can count on calls coming in— just expect that it is when the homeowner is ready! Tip: Make sure that you are ready to track responses to your mailings. You’ll not only receive phone calls but also traffic on your website and online estimates. See our additional tips on tracking responses here. Since 2003, we have partnered with movers on their direct mail campaigns. We are excited to announce that we have a new change to our service to ensure your timing is even better; Daily Leads and Daily Leads + Fulfillment! This update allows us to continue down the alphabet in the Mover’s ABCs of Mover Marketing Timing. Our new Daily Leads Service provides the same high-quality leads as before, but now we are delivering them every weekday. These will be the freshest leads available, and you’ll be able to get your postcards in the mail sooner and be in-home faster. When you use our lead plus fulfillment service, you can rest easy knowing we are providing the best daily fulfillment option out there. We print your postcards and mail the postcard on the SAME DAY you receive the lead. And because we only use First Class postage, your postcard arrives in-home quickly. This is the fastest, most accurate service in the industry! Tip: Save your staff time hunting down qualified leads and mailing postcards and put them to work on providing superior moving services. We’ll do all the work of lead generation and fulfillment so you can concentrate on what you do best – booking moves and moving customers. As you can see, mastering the timing in mover marketing is achievable. Using our daily leads and auto-fulfillment services will give your moving company the winning advantage. To learn more, give us a call at 303-443-0767.